Do you need professional LNMP, Nginx , Memcached ,Nginx Cpanel installation services? Or someone to take care of your server for a reasonable rate? Contact me on admin@ruchirablog.com Pricing start at just $15 for basic LNMP installation. I have published article about my modified nginx auto installer about little over a year ago. Which can be found here. Which got somewhat famous and counted over 1000 installs. The framework which I was used was came from a chinese developer called licess and the framework now has been evolved a lot and now we can count it as fully fledged auto installer. It now includes latest nginx version ( Which lacked at the time which I modified the script to include the latest and greatest) . And also now it includes separately tweaked installers for debian, centos, and ubuntu, which I had on my modified installer since day one So its nice to see that he baked 2 options which my modified installer had since day one. This installer is extremely useful but its not popular in the international community since its written in Chines and no support provided on English. So with this post I just wanted to introduce that great tool to you guys and edit the original source code little bit to remove the time zone rewrites. Original installer rewrites the time zone to China. I have removed that so your original time zone will remain on the server. All the credits must go to Licess at www.lnmp.org for the original installer and your donations should go to him. 2. Decompress the install package-. It will ask some questions like your domain name , mysql root password ( Use your root password if you are newbie) just answer to them promptly. It will take at least 30 minutes to fully install and then you will see a massage saying install completed. So then you can try navigating to your ip address to see it working. 1, install eAccelerator, execute the following command. , follow the prompts to select the version, press Enter, it will automatically install and restart the web service. Enter to confirm, it will automatically install and restart the web service. And a advantage of the new installer is you can upgrade nginx or php with just one shell command. To upgrade the nginx execute the following command:. It will prompt a thing which you need to enter the nginx version number. Its simply asking which version that you want to upgrade. So head over to http://nginx.org/en/download.html and find whats the newest nginx version and enter the number correctly on the shell prompt. For ex- 1.0.10 and press enter. its just easy! PHP upgrade, execute the following command:. prompted, enter your php version number, such as 5.3.6. How to add more domains (Virtual hosts) for this setup? Cant install this yourself? Cant get it to work with WordPress or any framework that you need? Do you want someone to manage your server and security ? I have 4 years of experience with Linux,Lighttpd,Nginx,Apache and WHM Cpanel . Contact me on admin@ruchirablog.com pricing starts at $15. Here are another guides for full LNMP 0.9 setup! So enjoy your server and please add a comment if you are happy with outcome! PS- To keep in touch with updates (next releases) of this script you can subscribe to my email feed. No advertising or spam will be sent. You can unsubscribe at anytime! i need this one for newbie like me …lol ..
however how about nginx on centos 5.5 64 bit? is it debian better for running nginx than centos? This script is for debian. and do you have any specific reason to go with centos? If not try debian. Centos got so popular because cpanel choose it as their default os thats why centos is so popular. Yes i agree its developed and nice os but you should try switching to debian. Centmin does a great job too! But the problem is it doesnt installs phpmyadmin,ftp,eaccelarator,ioncube and stuff! Thanks for this awesome script. It’s working on 1st try without any single error. How to configure nginx.conf to running multiple domain/host on 1 server? and where is pureftpd.conf located? Its just very easy friend! Just issue ./vhost.sh command! And enter the domain you are ready to go! dunno exactly what php-fpm is..
Looks like PHP-FPM didnt installed on your server! Are you sure it installed correctly’? Which OS are you using? And PHP-FPM stands for PHP FastCGI Process Manager! Its efficient program to manage php processes and now its a standard on php 5.3.x you can find more info online! Is it possible to convert this so that it makes all/most of the additional items optional? eaccelerator , ftp deamons, ioncube are optional! But you can remove other things if you edit the code too! True but for the script noobies I was thinking of adding prompts (y/n) but no biggie. Any way of adding PHP-FPM and APC? Very nice indeed! Any thought on adding Cherokee as an option to Nginx? cherokee doesn’t have functionality like nginx. And not compatible with many modules like nginx. Any idea how I go about using a bare bones VPS running this script with Google Apps for Domains for email? Same thing applies to other dns providers also! Its very easy to use google apps with this! does it work on debian 64 bit? Yes it works on debian 64bit! I can confirm this works fine as well. Great script Ruchira! Thanks Joshua! And which OS that you used? to restart ftp “service ****** restart” will do the trick! @Ruchira, i have the same vps as buzzknow, we don’t have debian 5 32bit. i’ve installed nginx on Debian 5 64bit and got that error (PHP-FPM).. Try on Ubuntu and everything is working fine but if no index.html or index.php, i got Forbidden Access. access forbidden happens when nginx cant communicate with php. So if you hosting web site you will definitely have index.html or index.php right? Did you tried index.ASP or index.CFM files? yep, when index.html or index.php exist. it’s just fine, but when its doesn’t exist, then Forbidden Access.. Yes Im looking at PHP 5.3.3 I didnt added to 0.5Rb because some users reported to have problems with it. I run some apache sites with 5.3.3 and I felt some problems with 5.3.3 too. But I didnt investigated problems I just switched to 5.2.14 . But you guys can keep faith. @ruchira, i finally install it in centos 5 32bit, working fine like a charm..
but doesnt affect.. i want to create new mysql user..
Did you created new user on the admin panel of ftp deamon? If yes it should automatically restart the ftp deamon! I am wondering – I am using the following AMI: http://thecloudmarket.com/image/ami-4a0df923–ebs-ubuntu-images-ubuntu-lucid-10-04-amd64-server-20101020. Will your script work with this? If not, is there a Ubuntu AMI that you can recommend – I would like to work with Ubuntu. Yes it will work on 10.04 but it might not work on 10.04.1 So you can install lucid 10.04 and then upgrade to 10.10 it works easily ! Great – thanks. I’m going to give it a try. Well running your own name server is not a wise idea. You can use a free dns provider! If you are using godaddy for your domain registration here is the guide http://www.ruchirablog.com/setup-dns-with-godaddy/ Other registrars like name.com has free dns facility for their clients also! is it tested spyware free? hi ruchira, how can i changing server header?? If you need to fully change server header you need to edit the nginx source files before compiling nginx. You cant change server header in nginx after compiling. But you can remove nginx version number from the header by adding “server_tokens off;” without “” to nginx.conf file. Ruchi, i wanna edit html error page, where can i find it? If you are using wordpress you can edit error template from template editor! If you are using some other web site you can search google to find out how to edit nginx error pages! hi Ruchira, thanks for creating the script, really-really helped me on my ipv4 server. i try to implement your script into another server, that only use ipv6. to get the LNMP script i’m using IPv6Gate adding url with .ipv6.sixxs.org , all the link in the script too. but always get error.. after ntpd / time update. Current script updates time to shanghai time which is useless (this happens because the main developer setit). Im adding the updated version within next 48 hours to keep current time on the server without updating. At the time of writing im porting the script to centos. If you want to install this on ipv6 server i think you will have to modify the whole script because source codes pulled from http not apt-get or yum you will have to change the nginx config after installation. You can try editing course code to use ipv6 use notepad++ (its free) if you are using windows. dont use microsoft notepad because this is unix shell script! if you need more help just reply here! this is my problem : script was succesfully download all files needed, but installation is not. can i proceed with manual installation ? is it fine with your script if i get nginx via apt-get ? thanks Ruchira, great script you have.. Thank you for this tutorial, its very help me. btw would you give me easy tutorial to install ffmpeg. Its nice to hear that this helped you! installing ffmpeg is depending to your OS and there are many articles on internet explaining that! And you can try searching google normal ffmpeg installation procedure applies to this auto installer too! No changes made to core except its auto installed! Can you tell me when do you got this error? in the installation or ? please be specific whats default install of phpinfo.php? and whats your ubuntu version? Now thats called being specific, It seems like some libraries didnt installed which needed to run php. Im using ubuntu 10.04 and this auto installer to run this blog and its strange to see that you got this kind of error as I tried installing many times on 10.04 and 10.04.1 , So please can you format your vps and retry with fresh ubuntu install? There is 99% of change that your server got some network connection problem when fetching libraries from ubuntu repositories! do you install 10.04 server or desktop? Its server edition! Why should I need Desktop edition? and what packages do you install when you install the system? yes none manually! Packages set to be installed on auto installer script! Your problem happened because some of them not installed correctly. Im 99% sure this is connection problem or your OS files should be corrupted! Any luck on new install? There should be some kind of error in your OS or network connectivity im 100% sure about this as this is caused by failure to install libraries! Im so sorry. if you can try with debian. Thanks for this tutorial, it really helped immensely, but I have run into a problem, after running it on CentOS, all the services are running, but when I navigate to my URL it doesn’t resolve. Do you have any ideas on what could be causing this? That article for godaddy. Same procedure applies for other DNS providers too. Contact me if you need further assistance! I did set the A record (I am using GoDaddy), a reboot of the server solved the issue. However, PHP is not working, if I try to go to http://myip/phpmyadmin I get an error message saying the page is not found. I added a phpinfo.php page to the directory, but when I try to go to that I get an error message saying the page is temporarily unavailable. Thank you pointing out the error but you can ignore this as I removed p.php from source because it might lead to security breach! Other things working properly? I have to tried install ffmpeg for more time but not succesfull, always got error. do you Have auto installer for ffmpeg? 1. sorry I dont have any ffmpeg installer and im not experienced in ffmpeg! please search google to find one fits for nginx. 2. For this easy way is FTP. search google on how to install FTP client on debian. and setup 2 users giving each access to specific directories! its not using any dns server! You can use external dns server or install it manually! I prefer external server because reduces time and easy to use! Any recommended external DNS servers ? any idea about percona ? well I dont knew about percona until you pointed out! Normal percona procedure will apply for this too because this is same as normal nginx installation. There are many DNS providers around the web. IF your domain is regitered with godaddy,name.com they provide free dns to customers! did you entered the domain name when prompted by LNMP? Tried it using Ubuntu and works fine. But using 150MB memory, anyone? Nevermind. Lowered php-fpm max_children value and now I’m at 80. Hi Ruchira how to enable php curl on this installation? i uncomment line ;extension=php_curl.dll on php.ini and restart lnmp but always failed. php_curl.dll? What do you mean by uncomment it? You only have to uncomment ; And I think curl is enabled default on this installation! Please provide details curl isnt working? Looks like you wiped it before i took a look! in my wordpress.conf it working smoothly..
i use w3 total cache too..
Well im not facing any problems so far. how to activate mail function? so we need to to edit this file manual before running autoinstaller? What do you mean by mail function? with this auto installer i can’t sent mail with native function from PHP. so how u make it work for sending mail ? Does it hangs saying resolving http://www.ruchirablog.com/………………….. ? i dont think its a dns problem, but what i do is restore image back, so i have a clean install, and i have all running now. Thanks Ruchira. i have add a child name server for ns1 and ns2 on my domain panel but how about add a record on dns zone of this server? You dont need to setup NS records in this case! Whats your domain registrar? Yes im having some issues with latest updates for centos and please use debian for now! Ill update this after I solve the issue! Im aware of this issue few users reported this. Im 99% sure this happened because some libraries changed meanwhile! Tomorrow im going to go one by one to check which caused the problem for some users. And I have tested with debian 32bit yesterday and didnt had a problem! And lots of users using this script daily and I can see that by my bandwidth logs ( nginx and such software packages pushed about 10 times a day each for this script using 1GB~a day). So Please tell me what error that you got! Does your DNS registrar offer free DNS service? Godaddy and name.com offers that! While LNMP ask me for a domain name, is it must be different with my hostname? Is vhost. sh capable to create subdomain too? Well to be honest I didnt tried to create sub domains with vhost.sh but you can try and it might successful! And when it asks for domain name enter your domain name not host name! For example take my blog. Im running same setup on this blog. So my choice for domain option is http://www.ruchirablog.com ! Hope you can understand! How much space is needed for the latest NGINX Auto Installer? NGINX Auto Installer always failed in the middle of process and give report not enough space. While I check my disk space, my 2 GB space is already full. So, how much space is needed for the latest NGINX Auto Installer? To be honest I didnt checked exact numbers of disk space this use. But I have installed it on 80MB RAM Debian 5 2GB disk box with 0 problems even ran wordpress on it. Ruchira … tnx from your answer. is it a good idea to install it on share hosting? and other question is nginx can reduce load on download server ? Nginx doesnt support some modules that people need. So installing nginx only ( without apache ) is not very good unless if you plan to offer pure nginx hosting service not normal shared hosting. Of course nginx reduces load on any server! I cant view that image! says its banned! yeah looks like it! You can enable it and follow this guide to add A records http://www.ruchirablog.com/setup-dns-with-godaddy/ dont worry about the registrar same procedure applies to everything! i try to install it on cent os but phpmyadmin cant load. strange! Can you try using ubuntu or debian? thats little bit complicated! You need to configure your Linux OS for this. Please search google! Hey mate, how do i remove an added domain? also the directory created, just an rm -rf? yes just remove the directory if you want! There are more steps do completely delete the domain from nginx. But directory remove will be fine! i’m succsesfully install your script, and having a wordpress site on my domain (vhost). how i can have a folder without effect of wordpress rewrite permalink ? you dont need to add any redirects if you add wordpress rewrites correctly? What are the lines that you added to nginx.conf to create rewrites? I have no idea about this, i try to restart but in the end of report, error on line..
its not ok It means that php isnt installed successfully! Whats your OS? I am getting this on WordPress site when selecting an option inside the admin interface : “No input file specified. “, why? Actually, I had this site working (w/ no probs) but I transferred it to another server. did you added permalink rewrites to nginx.conf? Manually? No. But chosed wordpress rw on ./vhost.sh installer. Do have to do it manually? can you access to your blog? and are you using permalinks? Yes I can, and permalinks works fine. However the wp admin panel options gives that error whenever I access them. actually that error happens when there is no such file! How many virtual hosts are there in your installation? I think there are two, 1 using dabr and 1 wp. Do you think this happened because of I am using two vh? I also check on nginx/conf/vhost dir and the domain is there w/ a correct rewrite. can please post here the /usr/local/nginx/conf/nginx.conf file here? open it via nano and copy the files paste to text upload the file somewhere and link it here! if you are talking about opcode cache im not getting that error! I have installed eaccelarator and using it to cache php. You can install it like me by using the single command that I gave you! working fine on Debian lenny..
whats the problem? I personally dont recommend installing FTP deamon on your server because its very old protocol and you can always use SFTP tp transfer files without FTP. How to install mail server, Webmail and how to configure Google Apps (Google mail) from your script / Nginx Auto Installer? Please help me. I want to install Roundcube / Settings my domain on Google Apps mail. if you want to enable google apps (im using this too on this blog) it need to be done with your DNS provider! Once you have added MX records your are ready to go! Its easy! Main problem, My Domain provider is Uk2 Group / ResellBiz. Another thing is, How to upgrade WordPress Plug-in without FTP account. there might be supplying free DNS for you check that out! You can login to SFTP and upload the plugins to wordpress. you can download new plugin and upload it rewriting the old plugin. thats little bit time consuming but 99% secure than having FTP account! suhosion must be installed on default and will appear in your php info file! Please link me to your vps ip and phpinfo page! FTP user creation is done on FTP deamon you can follow the guide to install FTP deamon and on that you can create FTP users. IT seems like your vps failed to grab the sohusin or some kind of other problem! Can you do a reinstall? And whats your OS? you can try installing suhosin but its not a must. Search google there are many reviews! How do I get PHP-LDAP working? I need to be able to run ldap_connect(). I am on Debian 5 and did an apt-get install php5-ldap but to no avail. Actually I figured it out. I did do an apt-get install php5-ldap. Knowing that it wasn’t in use, I found the other version of PHP now installed and found specifically the modules in /usr/lib/php5/ I moved those files into the /usr/local/php/lib/php/extensions/ directory your script made and simply added those moved modules into my php.ini file and restarted LNMP. All is well that ends well. Thanks! Google is your friend! Its very easy if you are using debian or ubuntu! Now Nginx / LNMP is works nice. But i can’t enable .htaccess / re write mood on Joomla. Its not working. Thats why i cant short my URL. Please help. htaccess wont work on nginx. but there is a rewrite method in nginx. Im using wordpress rewrites here on my blog but its different than apache htaccess you can search google for nginx drupal rewrites its possible to run drupal rewrites on nginx. How to change Time Zone after install LNMP? 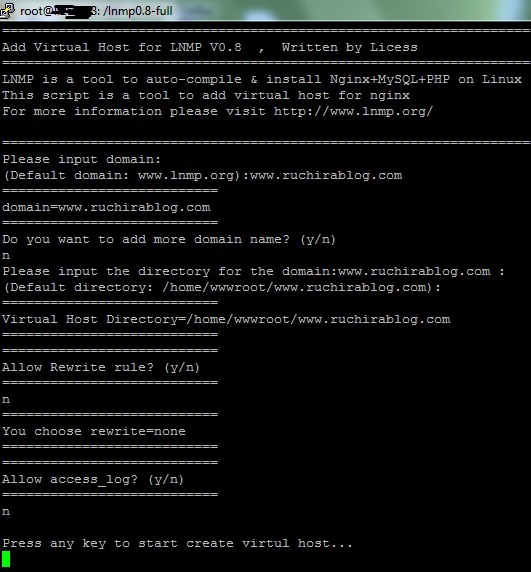 Its not possible re install LNMP again, because my site is running. Thanks for nice Script. Its helps Us. whats your LNMP version and OS? of course its possible to change time zone you can google about this! I install the LNMP script successfully (on CentOS 5.3), but I am getting a 502 Bad Gateway error when I try to access PHPmyadmin or any php scripts. What would be the issue here? can you try this on centos 5.5? Sorry for that! Best bet is trying LNMP original installer on http://www.lnmp.org or try this with debian or ubuntu which gives your latest nginx version unlike centos version! i am not friend with debian . can you tell me how can i wget and run installation? as same as centos ? yes of course. Use ./debian.sh on my script for debian use ./ubuntu.sh for ubuntu OS. Ubuntu Suks. Ubuntu grandfather is Debian so its my suggestion, try Debian. Its very good. then download and Install Ruchira Script. My http://www.Gournadi.com is run by this script from Joomla. Its run super fast. actually you are wrong with this expression. Im running this on ubuntu and note that ubuntu gets many updates and there is huge developers on it. Also keep note that Ubuntu gives latest software packages than any other linux flavor. Im running this on 512MB XEN guest and my host node runs on ubuntu too. hi ruchira, why my sqld process and php-cgi eat too much resource CPU?? I just installed the script and in process of getting DNS set up. In the meantime how do I do redirect all to http://www.mysite.com . I think now without www it won’t work. when script requested to add your domain dont you entered http://www.mysite.com ? If not its fine too search google for non www to www redirect with nginx. Its easy! Ok, but I can’t find nginx directory in etc/ I’m looking for sites-enabled folder with my domain. Where is is located? or do I edit something else? well looks like you didnt read the post! Adding virtual hosts is very simple in this! just run ./vhost.sh command! I understand that but which file I need to add rewrite rule for non-www ? No when adding the domain add it with www. then it will work fine! Where is nginx.conf located? it’s not in /etc/nginx/ like on lowendbox script. and where do I put rewrite rules for individual domains? When adding domains via ./vhost.sh you can specify rewrite tools if you are adding domains for wordpress etc. now your script automatically redirects non-www to www right? those rewrites are already in the script? Just add new site/domain with www. right? does your script remove innodb support? I think you said this site is running on it, have you tried running more than one on this script? Yes this doesnt include innodb support! And how many sites is not the problem! You can run thousands of sites even on shared hosting but traffic is what to care about! You arent using lnmp because I can see that there is BIND running and it doesnt even included with lnmp. okay, if you say im not using that script. i dont know php-cgi instaleed or not, but that fact is like that. i just reload OS on my vps after that install your script(no install anything just (update and upgrade), and running my blog script again. any chances to chat with you?? i want you to see my vps configuration. Whats your OS and who is your VPS provider? Are you using centos install bundled with kloxo? Hi Ruchira, i runed the script in my dedicated server, but there’s some issues. there’s a script for remove everything installed with nginx installer script? How about SSL? Do you configure it to work with that? I need the path to configure that. I have OPENSSL installed. Also for some odd reason PHP mail wouldn’t work, but I used a SMTP library to send mail from the server instead. In default nginx is compiled with SSL module. Please search google about the detailed steps on SSL setup with nginx. i had been try using ubuntu/CentOS but still same. for CentOS seems php-fpm not installed properly, i dont know what must i do. i must talk to the provider about this?? Can you give me root access to your VPS and control panel so Ill check it out! If you want use my contact form to contact me with your vps login details! can you tell me how to set up a cron job on lnmp? i need it to empty my lnmp logs automatically..
Have you used eAccelerator with this? If I install it and have problems, how would I disable or uninstall it? Yes I have installed eaccelerator im 100% sure that you will never face any problems with it! Its very nice php caching plugin! Definitely install it! ok I’ll try it. It will be used with W3 total cache WP plugin. Thanks. In case I do have issue how to disable/uninstall? I installed eaccelerator that came with your script. According to http://eaccelerator.net/wiki/TroubleShooting , in tests it is not loading or working. Is there anything else I need to do besides running ./Eaccelerator.sh command to get it working? if you can see it on phpinfo file its working! You dont have to any additional things! I got your message! Looking in to it now! No it is not showing in phpinfo. Should I try installing full version via wget? will that work with your script? Or do you have any other suggestions. actually its very strange that it didnt installed successfully! Can you give me the link to your phpinfo page? YEs you can try installing it manually its easy. It created eaccelerator-cache folder as well but nothing in it. I get the same error, where php doesn’t isntall. managed to install it with new version (V0.5.1RB) the only thing is eacclerator was working but for some reason php.ini wasn’t being written to..so I had to manually add these lines to php.ini for eaccelerator to work. I’ve got problem when accessing wordpress dashboard pages..I always get “No input file specified.” error message…I’ve been looking for the solution using google but still no solution so far. Is it something to do with the permalink conf? yes it might be a problem with wrong permalinks! Im glad you asked this I can find many places that copied my posts without getting my permission! Yes feel free to translate it but kind enough to link my page! Thanks for keeping credits Guys like your type are hard to find these days! what are you running in port 8011? Did you modified ports on nignx.conf? is that mean that nginx work on port 8011 and 80 ?? another question is i always see this error in my log..
this problem is happening because wrong DNS setup! Check your second domain DNS config search google for more details about nginx multiple vhosts on same ip! is there a way to configure this script to use TCP port instead of php.sock ? actually why do you want to change that? You wont see much difference on that on Linux systems. I need it to run social network script that uses it’s own page handlers. It requires special rewrites and I tried it with php.sock and get no file specified error on certain pages. I dont think changing to TCP socket will work for you but im not 100% sure! How did you found that moving to TCP socket in nginx will fix your problem? I’m not sure it will fix it but the only rewrite example I found uses fcgi pass through TCP port. I guess I could install stock Nginx and php, mysql but I was trying to save some time using your script. just install fresh on 512MB vps and when I import database in phpMyAdmin I get “504 Gateway Time-out” error? increase your keep-alive timeout limit if your upload takes too much time! It installs fine, but when I access /phpmyadmin ,it says 502 bad gateway. thats common problem happening because of library mismatch with new versions of centos! Can you use centos 5.4 to install and then upgrade to 5.5? Or use ubuntu 10.04 its much better! Thanks for autoinstaller and additional help, thanks to your script and kind assistance have my first two WordPress sites up and running. I will be starting to port other sites to my new VPS in the comming weeks, after doing some more testing. The vhost script is going to come in very handy, as I have quite a few domains to manage and move. Should be a Doddle now ! Do you know How could I replace a php-cgi installation (made with lowendbox.com/blog/wordpress-cheap-vps-lowendscript) with php-fpm using your script ? if yes, after doing it Could I normally install eAceccelerator using your script? well its easier to use my script than modifying and mixing it together! If you want to run my script on lowendbox just lower the php max child value after installing! I have tested my script with 80MB XEN from quickweb and loadimpact doesnt even make a blip! This is exciting. I’m going to try this script right now on my test vps. NGINX configuration is the biggest hurdle I have from making the switch from a shared hosting provider to a real VPS. Thanks for posting. can we login as wwwroot instead of root ? No it doesnt have proper privileges ! Just noticed that LNMP has been updated to 0.6, not sure the benefits to it though. I wanted to know if it was possible to have the script use the latest versions of Nginx and PHP (as an option). Some options like Ubuntu specific installer package is already enabled in my modified version since i released it so its nothing new. Difference is he released nginx upgrade script which is little bit useless at this time because LNMP RB runs 0.8.53 but it will be very helpful for centos users and all users in future. So Ill test official LNMP 0.6 briefly and make any necessary changes to my modified release! All the credits goes to Liccess at http://www.lnmp.org without him this kind of all in one nginx auto installer script wont be possible for now. Sorry for the double post below not sure what happened. Please forward this error screen to serversreview.net’s WebMaster. php-fpm is new method of managing php instances and it will be definitely fast than cli. But if you are using a low end box like 80MB RAM CLI is for you. Dont try to squeeze all in to small amound of memory because its useless. try to full use the available memory! Thanks for the info! I sent an email to the webadmin and website is back up. LNMP has been updated to 0.6 any improvements worth noting? Also can we manually upgrade php and nginx to the latest and will doing that mess anything up? Hello, i just curious whether there’s any problem with phpmyadmin and suhosin in this autoinstaller, because suhosin setting must be done carefully to make phpmyadmin works perfectly, thank you. No nothing is problematic! Next time commenting be sure to use your name not urls! I found your comment on spam queue! I was playing around with some tweaks after installing your script and I messed a minor detail up. afterwards it was easier to just run your script again. Unfortunately when I did I ran into a number of erros during the install. I ended up having to re-install the OS template and run the script again. Also, any possibility of adding remote vps setup? I would love to run this script from a central VPS and have it reach out (in batch mode fashsion) to a number of other VPS’s and set them up. well currently remote setup is impossible. but if you play around bash scripts you maybe able to create it ! problem installing database connection error..
thats not a common error! Check your passwords! Database password is also the password that you supplied while installing. Also database administrator password is root on default! its was innoDB mysql problem solve. LNMP 0.6 was out..but nothing new on that package..
./vhost.sh is not works properly. Please write a tutorial ./vhost.sh and Domain panel, how to set that? what is the problem that you getting? can you tell me what version of centos that you using? Thanks mate! Looks like someone removed those 2 files from my server because proper file permissions not set for those installation files. Now I have added permissions and 2 files. this *should* fix all of the php not building comments. yes other using the same thing! Thanks again for pointing this problem! Can i use apt-get install and which packages should i use ? Oops! I didnt had time to test this script with debian 6. Looks like it got problems. For now can you install debian 5 ( If you are using vps this will be easy) and after the installation update to debian 6? It will work for now. However Ill work on this to get it working with debian 6 but no ETA yet! But for example can you install nginx “manually” and then install php5 and with apt-get , whats the difference in installing with apt-get and the manually install ? Not much difference but with normal install you can have more custom with your choices while apt-get does predefined thing! but when I go to mydomain.com/phpmyadmin and parsing .phpI got 502 Bad Gateway? hey, thanks for the great instructions. I have one small question. How do I get to the mysql console? I want to import a larger database that is to big for phpmyadmin. do you mind using bigdump? google it! very easy to use! but when i tried to install in other box, wordpress with high traffic (400 online in the same time) it become slower and i get high load cpu from php-fpm. can i see yout php-fpm setting for my example ruchira? give your server data before getting in to conclusion! I mean what are the specs of your server? And what are the mods you done to default php-fpm file? There is no way 512MB handling 400 users at a time with wordpress fast like you expect if you not using memcached! Try memcached. if you have atleast 1000 posts you need to upgrade because your ram isnt much to handle memcached instance! And if you are getting CPU loads less than 50% there is nothing to worry! Dont expect CPU loads to be like 0.1% when you have 400 users online at a time. Upgrading to 10.10 breaks this, reloading lnmp I get “./lnmp: line 70: /usr/local/php/sbin/php-fpm: No such file or directory”. Also get a 502 on /phpmyadmin. Tried it 3 times. actually I have tried upgrading to 10.10 months ago and nothing happened! configuration sites-available , you can tell me where it is in debian or how to protect my folder htpassswd and file I have to change? i found this site through LEB discussion. my question is, i have using LEB Nginx script. very easy to install wordpress. my problem is, i can not install phpmyadmin. i go to your script, i see phpmyadmin is support, but i dont see the command for installing wordpress. how to install wordpress, do i need download wordpress installation? you can download wordpress and use Filezilla to connect via SFTP and place wordpress files on the server! Its very very easy! were should i place the files on the server? On /home/wwwroot/ ? I keep on getting 502 Bad Gateway while trying to get into phpMyAdmin, clean Linode 512 VPS running Ubuntu 10.04. Unfortunately Linode does not have Ubuntu 9.04. I might try Debian now. Hi, me again. I’ve tried With 8.04 again (after installing updates for it, but didn’t upgraded to 10.04) and the main domain I’ve used works (www.steamunpowered.com) but phpmyadmin still gives 502. The same goes for my other domain (www.stranded.eu). this happens because some php libraries missing from the install! I need to investigate this problem and it takes time. Ill get in to it hopefully today and inform you! hmmm I cant understand your comment! I can increase my number to nginx to run faster when more people view site? ram 2Gb chip core I7 is enough? whats your average simultaneous user amount? and do you getting any slow downs? Whats your web site? why do you change that? I’ve just a little problem : the phpmyadmin isn’t installed How can I reinstall it properly please ? how we can delete domain on nginx? its little bit complicated! But delete the files via SFTP and then delete the DNS entries on your domain! You wont get trouble! Hi, need to know how about installing php 5.2.17? How can i update the PHPMyAdmin to latest version after setup of your script? Also i need to update to latest Nginx as on Centos i got a very old version. yum upgrade do not work!? yum wont work on this as this install is a custom one! Yum will only work if we used yum to install files! did you do a good job. After nginx upgrade to 1.1 did you notice any improvements? have any issues? The Debian/Ubuntu option is clearly broken. PHP is DoA. hmm did you tried lnmp.org mirror? anyone knows what’s up ? yeah debian 5 latest updates might broke it! You can try http://www.lnmp.org auto installer. they have the newest one! Are there any benefits or downfalls that you are aware of for running it on Centos insted of Debian? absolutely no! There is no much difference. It depends on your flavor I like Ubuntu most because its stable, easy to use, apt-get is really nice etc. http://www.ruchirablog.com/uptime.php I’m running this blog on ubuntu 10.04 and you can see that im having nearly a year of uptime with it Im having about 1500 visitors and 2000 page views a day and server load is not going beyond 2 on average! Which is really nice for XEN VPS with 512MB of ram. But hey I have boxes running Centos too. and in my experience I found that centos cpu load is fluctuating than my ubuntu setups. I guess I’ll try Centos since William reports that works still. I really would like to use Debian but have no choice unless it gets fixed or someone finds workaround. how to i configured this one?? you need to install FTP deamon to auto update and install plugins/themes/wordpress! You can search for guide to install FTP. Or you can go oldschool by manually upload updated plugins by overwriting old plugins! Thats what I do! how do i configure the firewall? how do i add rules if needed? Once you’ve completed the steps in this post. Would you say that your server is secured enough for a WordPress blog? I plan on switching to Linode and am considering using this as a tutorial to setting up my VPS. I was even thinking about dropping cPanel but I just fear for security. The best example that you can see is this blog. If you need more security you can install more stuff additionally to this! I can not figure out what the problem is. This is directly following the auto-installer without modifying the conf file. Any insight would be greatly appreciated. is it work on ns1. domain.com and ns2 ? with godady we use dns manege and point ip to domain without host . then this script will install dns with ns1 and ns2 of that domain ? no you cant rename domains! pureftp is in chinese language. How can I uninstall it? arggg! Didnt saw that! maybe there is a switch for language! whats the error coming up? did you installed ioncube and eaccelerator? if then how? using the shell script or? Thank for the reply but i got it to work by installing both of those manually. Because it seem that both of them were install but php.conf file keep pointing at the wrong directory. I would like to know how is the way to configure several domains, like domain.com and domain2.com in nginx.conf configuration for this nginx auto installer? hello ruchira, i have i7 processor with 16Gb RAM. my site always 502 bad gateway error when peak traffic. if I should added a limit of max_children like max_children : 50; to this problem ? phpmyadmin and phpinfo.php work but not index.php Get white page…. did you removed any files? Problem fixed. I don’t know why but It’s Php 5.4.0 who give me the white page. I’m returned to php 5.3.10 and it’s work. thanks for sharing, its very usefull for me. i have installed it sucessfully, but i have some question. 1. how to upgrade phpmyadmin? 2. can i use powerdns to set up its dns? yes you can use powerdns. Hi again, i have a question on how to install mail so i can send out forgot password mail and registration mail for my wordpress blog. Could you please teach me how this is done? Thanks a lot i’ll try that out and see if it works ASAP. Okay everything works great, thanks a lot for your help. if I use the bandwidth of incapsula, how can I be setting up dns? cname and ip of incapsula? yes you can update those things. I have no idea about incapsula never used or heard of it. you can use any providers DNS. just setup A records to your IP thats it. you dont need to edit that! read the description first and ask the questions! May I know which option did you change to stop rewrites the time zone to China? I wish, lnmp.org should release a full package with english language as well. Where to write these commands? thank you for provide this free information! Kindly check your installer, it stops in between where it has to get some files from vsoft.net for installation. It is unable to grab files at that point of installation. Please check it and let me know. I can’t check netstat ? My Mysql attack.What should I do ? when i update nginx (1.2.4) & php (5.4.7), i get so many error , i can’t add new domain, see detail below, please help , thanks. Starting php-fpm Zend Guard Loader requires Zend Engine API version 220090626. Contact Zend Technologies at http://www.zend.com/ for a later version of Zend Guard Loader. i have installed my server through this script and its work perfect. i have used the Centos 6.3 32bit, all are working fine, php 5.2.17 with optimizor. and get the myrewirte.conf and include that into the mysite.conf file. please guide how to resolve this error. Ruchira can u update it to newer version of php and nginx ? also ftp ? I can’t seem to get this to install. Just before doing anything, is there a way to deinstall everything easily? I have HP Compaq vc4725 Thin Client . Kindly guide me how to install android and window OS on this. Kindly guide me how to and what type of Hard Disk I can install to it as it has no hard disk. whether it is set automatically? Sorry I didnt got you? i am trying to add a domain..help me..
i added it.. does it take some time??? check out this scrren shot..
i cant add only the “www”, if i add it it shows with the domain name like this..
SMTP login is correct , It’s not happening if I using lnmp0.8. I did not do any editing at all on the package lnmp0.9 ,as well as lnmp0.8. I was try on my IP.Board forum and WHMCS when I use lnmp0.9, smtp email facilities can not use. But if I using lnmp0.8 everything worked perfectly. Hey, why the php mail function goes slowly? Any solution for this? Finally how to create email address and how to add webmail ? ?